Chainsaw accessories from STIHL are designed to make a range of cutting tasks easier. The handy carry bag or case is ideal for transporting or storing your chainsaw. Browse the range of scabbards, designed for safe transportation of your chainsaw. 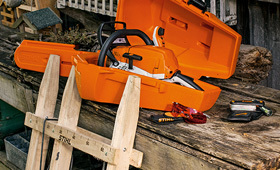 Use a STIHL sawhorse to make cutting firewood more secure and accurate.